Note: Updated in June 2018 for clarity and additional resources. We all have unique ways of handling our feelings, and sometimes we can let our emotions get the best of us. I’m no exception! I have the tendency to overanalyze, over-spiritualize and overly obsess about my feelings. But we’re not at the mercy of our emotions. We just have to know how to handle them. Watch the video below or keep reading to see my three spiritual steps for handling your feelings. These steps have greatly served me, and I hope they help save you time and energy when it it comes to working through your feelings. How are you currently handling your feelings? Are you not dealing with them? Are you avoiding them? Are you holding onto resentments? Are you talking about a feeling way too much? Are you pushing it down? In other words, what is your process? And in what ways is that process helpful? In what ways does it need a little love and tweaking? For the next few days, pay close attention to how you handle your feelings. Observe yourself and be the gentle witness. You may want to carry a notepad or journal so you can jot down some observations when you have a quiet moment. In that moment when negative feelings come up, don’t wait. Say a prayer right away. When I had negative feelings come up, I used to immediately start talking about them. By observing myself I noticed that it usually took me about two days to turn to my spiritual practice for help. And when I did, I felt better right away. So don’t wait! Set the intention to handle these feelings with grace and love, and to be willing to forgive and then let the process unfold. It’s okay to flip out. It’s okay to talk about your feelings. It’s okay to bring them to the surface. But most importantly, we want to bring the spiritual practice in from the get-go so that that energy of healing can be guided. A simple prayer is all you need. When those feelings come up, say a prayer such as, “Inner guide, please help me handle my feelings with grace and love. I am willing to see this differently. I want to feel good.” You can also make the Kundalini meditation for mental balance a regular practice. When negative feelings like anger, resentment and disappointment come up, we can react really fast. Sometimes we want to send that email a little too soon. Sometimes we want to make sure we’re heard, so we curse and yell. And sometimes we want to just stifle our feelings because we don’t want to deal with them. So this last step is to simply let go and allow. Let the process unfold naturally. Rather than thinking you need to send that email right away, or call every friend you have, or stuff that feeling down, just be present in the feeling. Don’t get so hung up on action. Just let the feeling coexist with you. If the feeling is especially difficult, there is a gorgeous meditation in my Miracle Membership and in my book Judgment Detox called Riding the Waves of Emotion. Practicing this meditation will help you to feel your feelings safely. Be present in the feeling and then allow your intuitive voice to guide you into action. Allow your intuitive voice to say, “Yes, now it is time to speak up,” or “Now it is time to talk this through,” or “Now it is time to write the email.” When you let go and allow, you give yourself some emotional breathing room. You invite in spiritual guidance and you can take action from a more peaceful, empowered place, rather than from that heated, angry, resentful place. This is a process that I’m going to bring into my own life. I share it with you because I know that I’m always going to have moments that are going to piss me off. I’m going to encounter people who push my buttons and situations that take me out of that happy place. So will you. Be we all have a choice. We can deal with those people and situations from a mindful, spiritual place. Or we can deal with them from an ego-driven, low-level place. Today, let’s choose the mindful, spiritual approach. When your emotions get the best of you, follow these three spiritual steps for handling your feelings. Take a radical road to self-love and miracles! In the video above I talk about the paperback release of my memoir, Spirit Junkie. In this book I share my own authentic story of transformation. In the process I share beautiful lessons from A Course in Miracles and other spiritual sources to help you experience your own miraculous transformation! You can pick up your copy of Spirit Junkie here. I was just recently having this conversation: is “venting” truly healing? I love your ideas here! I personally think it’s all about how we “frame” our challenges. Every difficult emotion or experience is an opportunity to discover an insight to help others. Love you! love right back to you! Thank you for the very useful and very needed tips! Omg this video was exactly what I needed. I’ll be doing so well and then a situation will come up and my ego and feelings will go crazy! I’m definitely going to put this into practice next time a challenge comes up! Thank you Gabby – so much synchronicities in this video + my life the past few months. I for one am guilty of suppressing feelings through addictions with food. And of course this doesn’t solve anything since it was never the solution. Have been tuning into my intuition + higher self lately, and have found that life is much easier and I feel so much happier doing so. Just found you and I’m in love with what you stand for and for what you teach. Can’t wait to get my hands on all your books! This Vlog fell into my lap at a perfect time. Thank you for sharing! Wow, what great wisdom and your timing with that message is perfect! I am really working on being more conscious about how I handle myself when I have been “activated”. One thing I am also working on is looking at what about the situation is my sh– coming up and owning that. I find that if I can deal with that separately before I respond, my communication will be more authentic, forgiving and compassionate. What a powerful set of tools, thank you 🙂 I just moved to London and have been coping with serious feelings of loneliness & acting out on them in weird ways….really excited to put this to work! Hi Gillian! I am moving to London on Thursday and would love to meet up with a fellow spirit junkie! Hey Gillian! I’ve dealt with feelings of isolation when moving to a new city. Have you tried meeting people on meetup.com? I’ve met a few great friends there. And yes, try herfuture.com, the ladies on there are SO supportive and awesome! Good luck and keep your chin up darling! Gabby, I needed this lesson today. Your suggestions are terrific and I will be putting those in place. Thank you!!! I’ve heard this a lot – to sit with my feelings – but I feel like I’ve always been quite judgmental about them even if I’m sitting with them. Great reminder, thanks! I love this too… “sitting with our feelings”. Just being present and “honoring” them. And if needed, let them flow through you. Gabby has a great message! Thank you! I just actually tried this out a few times and it has been amazing how things just seem to work out by itself. Or I just listen and pick the right time and gesture to resolve an issue. It is kinda freaking me out in a good way! I totally think the allowing part is the hardest and being able to hear your intuition, and having the courage to follow it (a big one for me) . Thanks for the reminder! Thanks Gabby! I’m loving this “allow” step that I’ve really struggled with in the past. But the tiny reminders that have been finding their way to me (like yours) are keeping me in check 😉 Thank you for that! This is great! Thanks Gabri for speaking about this topic of handling our feelings in the best mindful way. This came just at the right time and I am going to practice these steps!!!! I, too, chose the mindful spiritual approach! Thanks for this Gabby! I deal with my negative feelings through mindfulness. When I start to notice my mind spinning out of control with negative thinking (which usually comes in the form of catastrophizing when thinking about the future), I ground myself in the present by really noticing everything in my environment using all of my senses. I take a deep breath and remind myself that I don’t have to have everything all figured out right now and I immediately feel more relaxed. I’m going to start implementing my prayer practice sooner too – that’s a great suggestion. Thank you for normalizing the human experience, as always! Love your way of grounding yourself and being present! Thanks for the good advice. I’ve been grounding, centering, meditating, listening to my breath… all of these things lately and it’s helped a lot to deal with the intense emotions that start coming up! On the day i told him to leave my house by the end of the week – this was very much needed today. I know it’s the right thing to do but it’s incredibly sad. And managing my outpouring of feelings has definitely been an issue today. Thank you. Thanks Gabby! Perfect timing for me to receive this message. Each day I’m moving closer to peace. Today is my birthday and I’m ready for a new year to begin! I love the prayer when you start feeling rocked. I’ve written the process in my journal to reread it when necessary. Thank you Gabby! Thank you, Gabby! As an empath, I find it difficult to handle negative feelings. I am also going through depression and when I get into the state of mind where I’m in tears feeling hopeless, I am not sure which spiritual tools to apply. I say a prayer and try to disassociate hy higher self from the experience but it’s really hard when I’m emotionally hurting. How does one feel their feelings and not fall victim to them but release them? P.s. 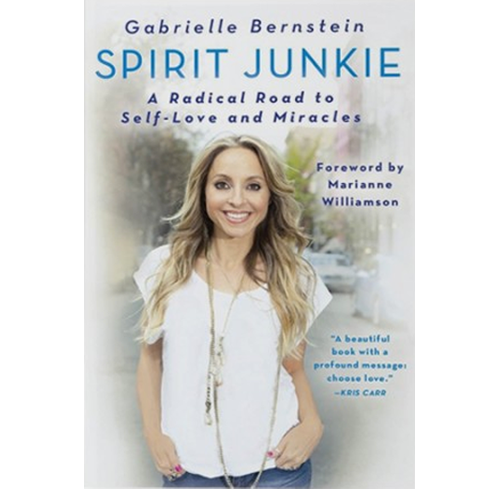 : immediately ordered the paperback of Spirit-Junkie and look forward to more inspiring advice to come up! Thanks for this wonderful video. I know that I struggle to deal with my negative feelings, especially in being present in the moment. I often rush to fill myself up with other external distractions, and while most of those distractions are good ( like helping others), I neglect myself. Thank you for the reminder of how to be in the moment and how to find a healthier process to deal with things. What are your top tips for avoiding overeating? What do you do to recover from a binge? What about when someone you love hurts your feelings. You try to talk about it calmly, but they shut you out and put up a wall. So now your not just hurt over the arguement but at the disregard for your feelings.